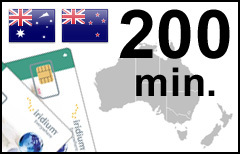 The Iridium Southern Cross plan provides discounted airtime rates for customers using Iridium satellite phones in Australia, New Zealand and 60 miles (100 km) offshore. IMPORTANT! The Southern Cross plan has been discontinued by Iridium. Any SIMs that were activated before Feb 15, 2017 will be valid until their current expiration date. Geographic restrictions. Iridium Southern Cross subscribers can place outgoing calls and send text messages ONLY from the territory of Australia and New Zealand, including 60 nautical miles into their coastal waters. It WILL NOT work for outgoing calls anywhere else. The account can be refilled with Southern Cross 200-min vouchers as often and as many times as needed with all unused minutes to be rolled over. However, the validity time will not combine, so the maximum validity of available minutes cannot exceed 6 months. NOTE: Do not purchase a new plan if you want to add more minutes to your existing unexpired Iridium Northern Lights account with SATTRANS. Get a new Iridium airtime voucher instead.